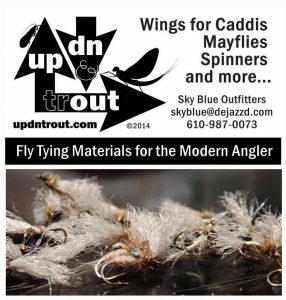 Note: All flies above were tied with the UP DN TROUT Wing Material. 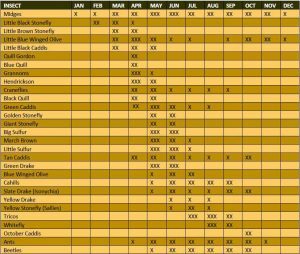 The Green Drake and Stonefly had CDC added. This is a “general” Pennsylvania Hatch Chart. Not all insects occur on all streams, and timing can vary by stream and by year. This chart is a good starting point to prepare for hatches across Eastern and Central Pennsylvania. All Flies on this page were tied with the UP DN TROUT Wing Material (and some CDC, Stonefly and Green Drake).